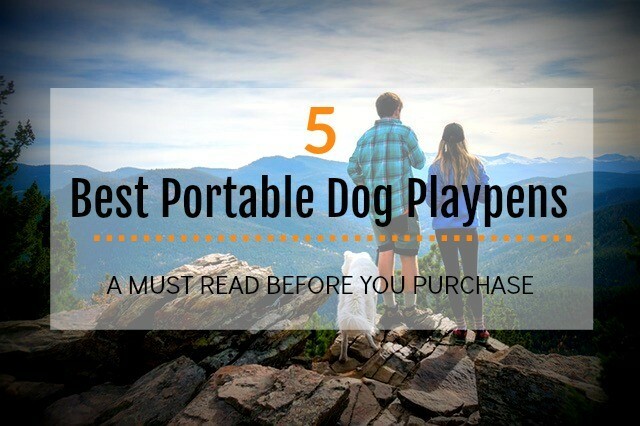 Looking for the best portable dog playpen to exercise your dog or going camping in? Good! Because playpens are a great way to keep our furry friends safe and secure giving them sufficient space to romp around. Owners have peace of mind without the worry their dog will get in trouble or worse run away. And a foldable and portable playpen gives you the flexibility to take your pet with you wherever you go. But not all dog playpens are equal so check out our five recommendations for the best durable exercise dog playpen for your pup to suit every budget and dog breed. Why Consider a Portable Playpen? Portable playpens are a great alternative to over-crating. This option gives your dog more room to play and move around when you are gone for long periods of time without letting your dog run loose around the house. Keeping them contained in a portable dog playpen keeps your pup happy and you happy because there won’t be any surprises when you leave them unattended for a while whether in the house or the garden (it saves your flowerbed from being ruined too). We highly suggest using a playpen for puppy potty training. Portable playpens can also be useful for other purposes. 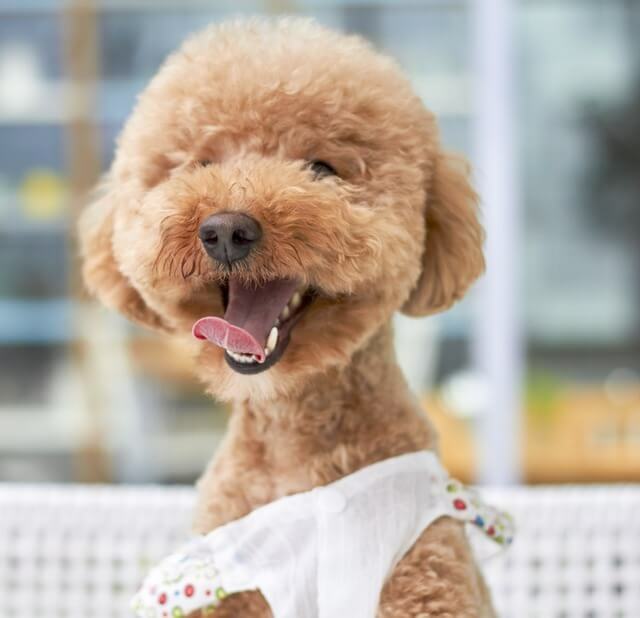 They can be used as a dog’s safe space and help them avoid separation anxiety, puppy potty training, to contain dogs around guests, or as a space for them to dry off after coming in from the rain. Certain portable playpens can be brought outdoors for play and even brought on camping trips to keep your dog safe and close by. Keep in mind that there are many different types of portable dog playpens and the one you choose will vary depending on your dog’s size and how you plan on using it. Our buyers guide is a great way to narrow down your search and make the right purchase for your furry friend. Here are six main topics to consider when choosing the right pet portable playpen for your precious pooch. There are three main types of puppy playpens that you need to consider: wire, wood and soft dog play pens. Wire dog playpens can be very large to suit all breeds. Spacious enough to exercise more than one dog. A little heavier than soft playpens but still light enough to be carried. Wire pens generally have no bottom pad. So in winter, you'll need to invest in some type of padded flooring for insulation. They're also easy to keep clean. The main disadvantage to buying a wire dog play pen is that they may not be high enough for dogs who like to jump. The MidWest MaxxLock Split Door Exercise Pen is a typical wire pen. Wood dog playpens are quite stylish and appealing to owners who like to blend it in with their interior design. These pens are marketed as home furniture and hence why they're more attractive than your typical metal pen. Due to its higher spec, comes also a higher price. These pens come in different sizes and thus suit all breeds. Although wood pens are larger in size than soft playpens, they're not as spacious as a wire pen. The wood pen is also more durable over the wire pen. Many wood pet pens provide washable bottom trays that allow for easy maintenance. The R﻿﻿ichell Mobile Pet Pen is a typical wood pen. Soft dog playpens is the best pet folding play pen and a favorite among pet owners. They're very light weight so it's easy to set up or to take down. In winter, soft pens can be quite warm inside due to the materials used. Softer pens are also very comfy for your pets to be in; are waterproof and thus easy to keep clean. Compared to wire or wood pens, these are relatively less durable. So for energetic or very active dogs with a history of chewing habits, this type of pen may not be the most suitable. A soft dog playpen is more suitable for small and medium dog breeds. 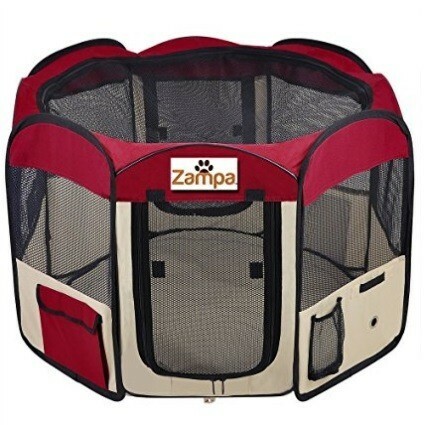 The Zampa Pet Playpen Foldable Portable Exercise Kennel is a typical soft dog play pen. Soft-sided (this may not be the best option for Houdini escape artists who will try and chew their way through). Water-resistant (best if they are going to be used outdoors, water resistant bottom panels make it easier to clean up messes). Portable dog playpens are generally made for small to medium breed dogs, but if you try hard you can find a playpen for a large dog. 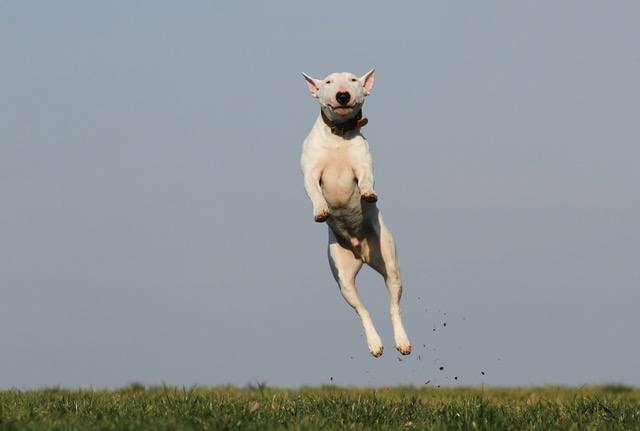 The main thing is that it needs to be high enough that a dog can’t jump out, and sturdy enough to withstand a dog’s strength. Your dog’s playpen needs to be a good fit for its size, no matter the breed. Many playpens can comfortably contain a dog bed, food, and water dish. Your dog should be able to stand up, sit, lay down, turn around and stretch out in the space comfortably. If you have a puppy you should plan for how big you expect them to get or they will outgrow their playpen quickly. You can also buy one that is customizable and add panels as your dog grows. If you plan to use the playpen for playing and potty training it should be a little bigger to give dogs space to play away from where they do their business. The weight of your dog’s playpen is something to consider that also has to do with several different factors, like the material, size of your dog, and how you plan to use it. If you plan to use your dog’s playpen in different places and will need to move it a lot make sure that you will be able to move it or know that you will have someone around to help if it’s heavier. Generally, plastic and polyester/mesh playpens will be lighter than metal or hardwood ones. Covers mostly come in handy to keep jumpers from getting out of their playpen. This is important for their safety especially if they are being kept outside in an un-fenced in area. Covers can also help outside to prevent a dog from too much sun or rain. 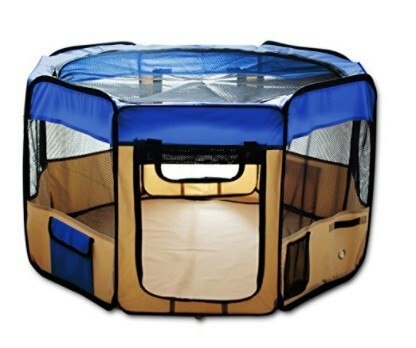 For the most part, these playpens come with mesh covers and zippered top and/or bottom panels. Some of these are made to attract or repel heat depending on the weather and are UV protected. It is extremely important as an owner that you understand that even though a playpen gives your dog more freedom than a crate, neither or these solutions should ever replace regular walks with your dog and playtime outdoors. Dogs have a lot of energy and that energy needs to be let out, otherwise they can become unhealthy, unhappy, and destructive. Portable playpens should be a safe place for your dog. It should be a temporary solution, never long-term or used for punishment. Slowly introduce your dog to its new playpen using positive reinforcement. Give the dog the idea that the playpen is a fun, good place to be. Make sure your dog has fresh, cool water available especially if you are going to be away for a few hours. Leave doggie toys and blankets for your dog so they are comfortable and preoccupied. 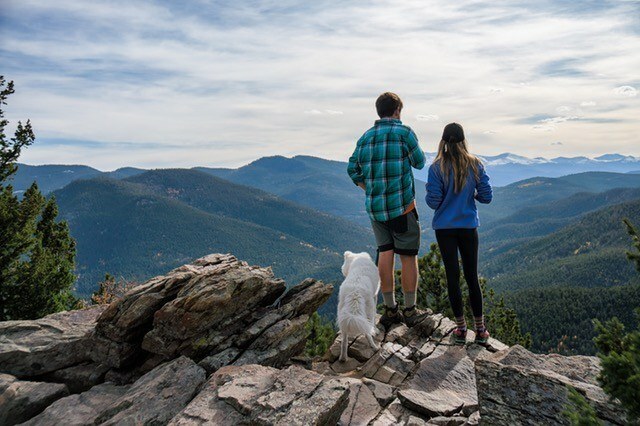 Bring your family pet along with you on your adventures. When used outside or on trips, portable playpens can keep your dog close by so they don’t get lost, stolen, or in any other bad situation. Keep in mind that dogs shouldn’t be left outside in a playpen unattended for long and should be out of direct sunlight. 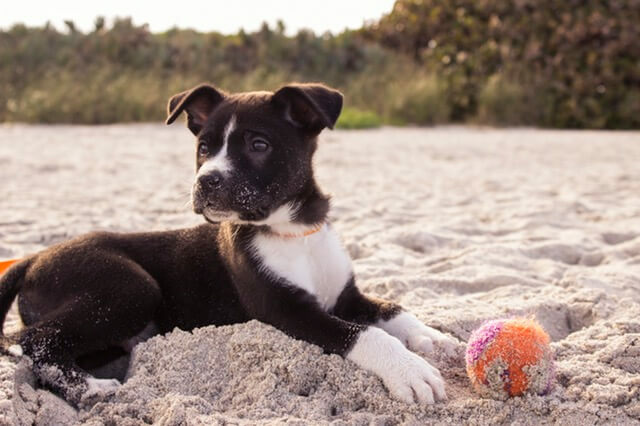 Make sure if you are purchasing a playpen that you plan to use outside that it is waterproof or it can break, rust, and potentially hurt your dog or lead to an escape. We did the detailed comparisons of the best selling dog play pens for you, so check them out. Zampa offers an 8-panel, 45” foldable playpen that is made for both indoor and outdoor use. This playpen sets up easily and can be taken down and conveniently stored in the included carrying bag. It also has an attached floor mat to help keep pets safe and contained, updated from Velcro which can lead to escapes. This playpen has a 100% money back guarantee for one year. It is made from water resistant materials, with protected seams to keep dogs from ripping holes in it. Mesh sides allow for both visibility and breathability. Customers receive four stakes to keep the playpen secured to the ground when brought outside. Additional features include: a water dispenser hole for special water bottles, a bottle holder to store an extra water bottle, and exterior pockets for treats, leashes, and other essentials. The playpen comes with a zip cover, is sturdy, and is lightweight. Dogs and their owners love this spacey playpen, with room for food and water dishes and extra space for play. We highly recommend this portable pet kennel since its safe, sturdy and effective for your small, medium or large dog. Bring it with you on camping trips, canoe trips or hikes since it's so lightweight and versatile. 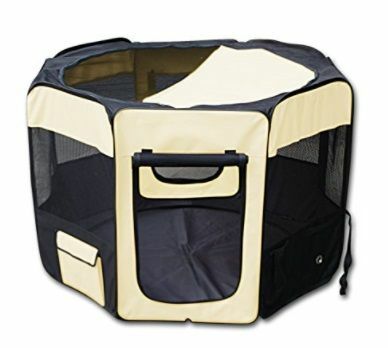 All in all, this portable playpen is a great way to give your furry friends a place to call their own! Esk Collection’s 45” is another great portable dog playpen for puppies and dogs that owners love, is simple to install and comes in blue, black, and red. The height is approximately 24” and it is made from waterproof, breathable, durable material that is also easy to clean. Reviews show that this playpen can withstand some dog chewing, but prolonged chewing may wear at the material. As a security feature, we love that there are zippered top and bottom panels that keep dogs from escaping, since Velcro is easy for dogs to pull apart. The playpen can easily be folded and stored in the complementary travel tote when it is not in use. The Esk playpen can be brought anywhere to give your dog a safe place to play and run around. The mesh windows and top makes it easy for owners to keep an eye on their beloved pets. 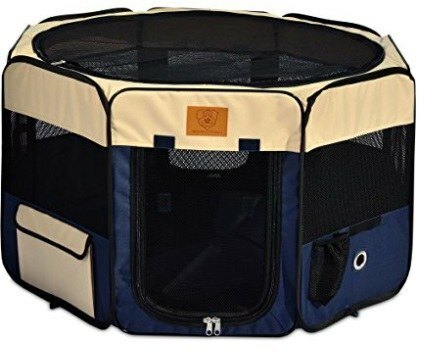 Dogs enjoy the space in this playpen since it's quite spacious and you can easily see what an ideal play pen it is for them to exercise in or a den for them to rest in. All in all, this is a low priced quality portable dog playpen suitable for small-to-medium sized dogs which we recommend for you to check out. May not be the best solution for containing large, strong dogs or heavy chewers. Precision’s soft-sided playpen is rated by users as 5 stars. And it's easy to see why! Like all other reviewed pens, it's waterproof, great for indoor and outdoor use and comes with a free carrying bag so you can easily fold, transport and store. Mesh panels make the playpen breathable and allows owners to easily keep an eye on their furry friends inside. The bottom floor and top panel are both removable and washable, and allow you to conveniently access your dogs. Precision’s playpen, like most indoor/outdoor opens, comes with stakes to make sure that the pen stays secure while dogs are playing so they can’t get away. This 8-panel portable playpen is packed with features and offers a variety of uses, including a play yard, traveling yard, training pen or activity pen. It is made to last with heavy duty zippers, reinforced corners, protected seams, and a one-year warranty against manufacturer’s defects. Owners love this crate because it is roomy and has space even for a bed, toys, food and water dishes, and extra room for dogs to play and move. Assembles in seconds with no tools required. Folds away and easy storage. Removable and washable bottom floor panel. 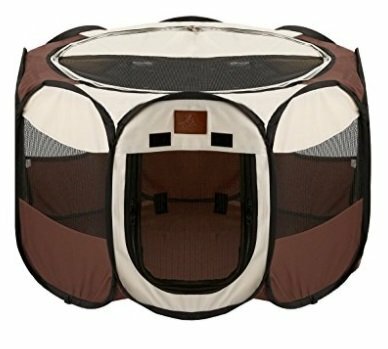 Parkland is another affordable indoor/outdoor doggy portable playpen which offers good security and portability for small and medium sized pets (including kitties). It folds down so it can be easily stored while not in use. This playpen comes with a removable zippered shade cover, is lightweight, and sets up in seconds which is a big plus when you travel a lot. Parkland’s playpen is made using strong material that has proven to be durable in most environments. We love this playpen because it has enough room for pets to roam around in and take naps in, perfect while you're busy at home or gone for a few hours. This pen has less netting and more fabric which makes it very easy to clean and maintain. It is brown and white and only weighs approximately 2.1 pounds, so it may not work as well for big dogs but a perfect solution for puppies and small breeds including cats. All in all, Parkland is another well priced doggie playpen and while it may not offer the full range of features as the previously reviewed pens it is very lightweight and an excellent option for allowing your pet to enjoy the outdoors with you. Very lightweight, may not be the best solution for big dogs. This portable dog playpen from YoYo Moon is 46” wide by 30” high, so it's perfect for larger dogs that don’t fit in most playpens or putting in several pets who get along together. YoYo Moon’s playpen has 8 panels is made from durable, waterproof, and lightweight material. This portable pet playpen can also be used for potty time, or just as a play area in your yard or when your RV'ing around. Zippered top and bottom panels keep dogs safely contained and help prevent dogs from escaping. YoYo Moon’s indoor/outdoor playpen is quick to set up and take down and has mesh windows as well as two mesh doors for maximum airflow and visibility. The mesh keeps bugs out and makes it easy for owners to keep an eye on that their dogs are doing. To keep in bigger dogs, this playpen has a strong steel frame with two zippered doors that makes it easy for dogs to get in and out. Some other features include a band to attach a dispensing water bottle, two side storage pockets, 4 stakes to secure the playpen to the ground outside, and a convenient carrying bag for portability and storage. Packed with features this roomy popup playpen is another top choice especially for larger dogs allowing them to stretch their legs out and get rid of excessive energy. There are many types of portable play pens for dogs but if you want something that is easy to set up, lightweight to move around, durable, and conveniently folds to put away indoor/outdoor playpens are generally the best option. They are waterproof and easy to clean, and most of them now come with removable top and bottom panels. Mesh playpens can be great options for small dogs but for larger dogs owners might want to go with steel or metal playpens that can resist chewing and can’t be easily knocked over. Owners should make sure their dog’s playpens are kept out of direct sunlight when they are used outside. It is also important for owners to know that these playpens should never replace proper walks and exercise sessions with their dogs, even though it can be a great way to give dogs more space than a crate while you are away. Portable camping or RV dog playpens are best to give your pup their own chill time or allow them to join you on your adventures be it in a campsite or in your own backyard. So get out and bring along your best friend for the ride, get a portable dog playpen and enjoy the great outdoors together! Thank you for reading and we hope you have found the information useful. What are your own experiences and tips for choosing the best portable dog playpen? Share your camping or buyer's tips below and please don’t forget to share with us if you found this content useful!